Mixture of conditions on the race back made for some interesting racing. Went in shore off the start and seemed to pay as we approached St Albans. Wind picked up round the corner and had to put a reef in but shook it out soon after rounding. Seemed to pick up some speed with the main flatted right off but it did not last as the wind died out in Poole Bay. 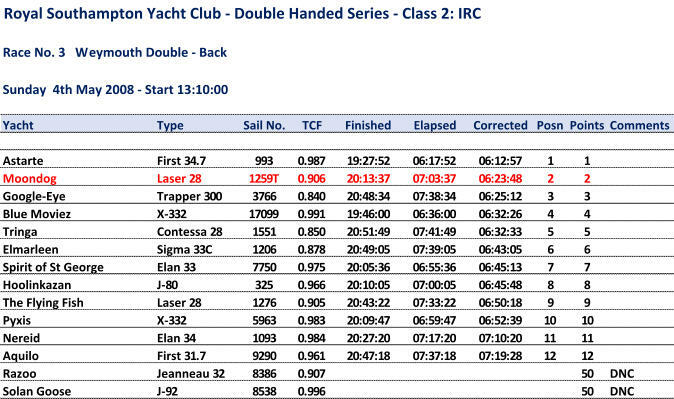 Wind shifted right round and ended up with a fast spinnaker finish at North Head for a second on corrected.